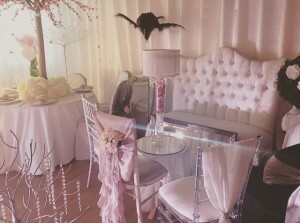 Every wedding bride and groom is unique, and it is with this in mind that The Wedding Lounge embarks on each new project. A dedicated styling consultant will work with you (and your mother, chief bridesmaid and best friend!) to explore and understand your vision for the big day. Based on this initial discovery phase, the team will guide you through the array of designs, colours, themes available and if required create something bespoke to suit your requirements to infuse your personal style into every detail of your event. Remember, The Wedding Lounge are experts at sourcing the most unusual fabrics, laces, accessories and other sparkly bits to ensure your day is everything you envision, so don’t worry if you don’t see what you want on the website – anything is possible. We are also adept at working within all budget ranges, and can make a little go a long way. Consultations can now take place at either our Essex head office or our fabulous new North London showroom. Our showrooms display luxurious fabrics, twinkling lights and amazing effects that stimulate your own creative imagination and provide you with a vision of how your day will appear. If you are unable to visit us, we are experts at conducting email consultations…. so even if you are living abroad and planning an event in the UK, our friendly team are there to assist you every step of the way. On site venue consultations can also be arranged on request.